Several months ago my then fiancé asked me if I wanted to go to Africa, specifically Kenya and South Africa after our wedding. April is a fourth-year medical student and just matched for a surgery residency in Corvallis, Oregon. It turns out that she has some time to kill before her rotation starts and had also been in contact with a friend of ours who is working with a remote clinic near the Masai Mara in Kenya. Within a few short weeks April had arranged with her medical school to receive credit for any clinical time she could acquire for both Kenya and at a major hospital in Johannesburg, South Africa. Her credits would also be counted towards an international rotation. Meanwhile I broke the news to my work that after my planned and approved two weeks off for our wedding in Canada and a honeymoon to Baja, Mexico, that I would be taking additional time off off to travel to Kenya and South Africa, cumulatively another two months. With some hesitation my work eventually approved the request. After an intentional four day layover in Turkey to check out the sights, sounds, smells and tastes of Istanbul we arrived in Nairobi, Kenya. With only minimal financial complications with Kenyan immigration regarding our visas, we were greeted by our driver Joseph who ushered us through the rain to his white van. A short drive later and a quick stop to air up the tires we arrived at the house where we stayed for two nights. I was nice to have a little time to decompress from the hustle and bustle of Istanbul and ease into the idea that we were now in Kenya. In the morning we met with Andrew Aho who introduced us to our drivers John and Peter who would be taking us out to the Mara where we were to spend the duration of our three weeks in Kenya. After helping Andrew and our drivers pack a few goods that were needed out at the camp we began our six hour trip. The drive took us out through the surrounding areas and countryside of the capital city of Nairobi, leaving behind it’s gas stations, business buildings, government offices, schools and shops. With only a few turns here and there, our drivers skillfully navigated the bumpy and dusty dirt “secondary” roads that took us along the scenic Great Rift Valley and through the developing agricultural areas of Narok. I don’t know what they are growing there but everything is laid out in nice even rows over rolling hills with only a giant acacia tree every so often to break up the order of it all. The only other traffic being a few small imported Chinese motorbikes and the occasional herd of cows or goats to nudge out of the way. Houses and buildings became more rustic as concrete fell out of favor for that of mud and earth construction. Eventually our driver Peter pulled his white diesel Land Rover to a stop on the side of the road and announced that he must go “bushy bushy! ?”, which in Swahinglish (Swahili-English) means “I pee in bushes, you go too”. This also indicated that we still had several hours of travel time left, so with no hesitation April and I took full advantage of the well needed impromptu pit-stop. 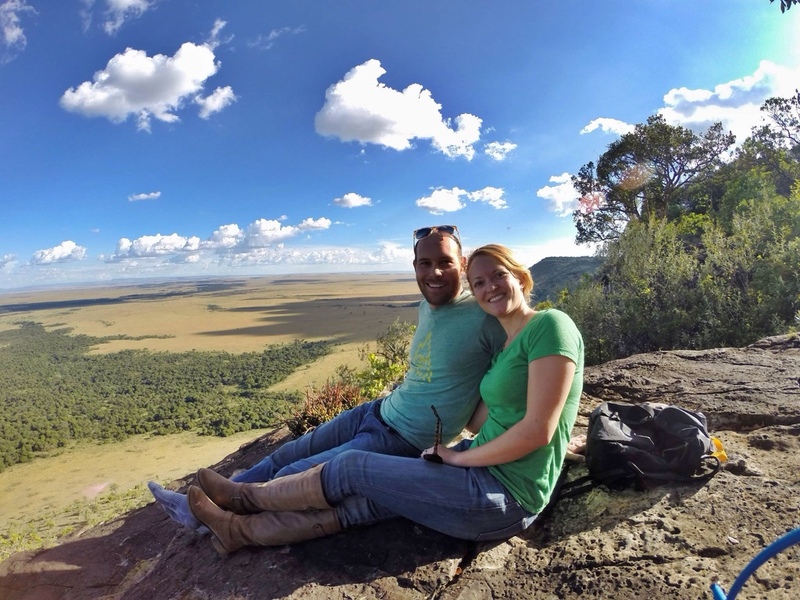 Within another hour or so we received our second announcement, that we had crossed onto Masai lands and into the surrounding conservation areas of the Masai Mara National Park. The secondary road had long since transformed into a simple dirt track, and I wondered if we were on a driveway. Then, after passing what looked like a meeting hall and school of a small village I was sure were literally driving on someones front lawn. Once over the Mara River via a narrow wooden bridge and up a traversing dirt incline we gained our first real view of the Mara. For miles we could see Giraffe, Buffalo, Antelope, Elephant, and Gazelle all wandering the grasslands below us. One last short but interesting hour later we arrived at our destination at Mara West Camp. We were immediately greeted by our host Francis Aho, who after a light lunch, gave us a brief orientation of the property. Mara West is perched high on top of the Oloololo Escarpment and as the name implies it overlooks the western edge of the Masai Mara National Park. The camp is self sufficient and specializes in taking clients on safari into the park. Mara West also boasts some of the best views from their accommodations in the area. Mara West primarily caters to high-end clientele and larger groups, however they do have some economic accommodations suitable for our extended stay and is conveniently located a short distance from Engos which is where the clinic is located. Once we were settled in Francis came by our tent and asked if we would like to take the motorbikes out for a little tour. Of course we said yes, and headed out to the maintenance shop. The shop mechanic “Engineer” made sure that the bikes were in working order and had just fixed the clutch cable on a Honda 250 aptly named “Mad Dog”. Apparently this particular bike has a colorful history of incidents. April was on “Little Red” a tame Honda 200. After fueling up we followed Francis out behind the property. Francis teared down the dirt path with ease while April and I bounced along trying to remember our motorcycle skills. Francis had warned that we should avoid the bushes, most of which have four inch thorns, because we’d will either receive a laceration or puncture a tire. Almost immediately we found a group of giraffes lounging in the shade near a cluster of trees. We stopped momentarily to regroup but then proceeded to chase them on the bikes. Very casually the giraffes would get up, trot away and try to hind behind a tree until one of us would flush them out again. To our amusement this game of hide and seek went on for several minutes until the giraffes realized that they weren’t that good at hiding and took off. After that first day near the Mara we know that our adventures in Africa were just getting started. Giraffe Ride – First real day in Kenya from Brian J on Vimeo. 1 Reply to "A Volunteer's Tale - "Arriving to the Mara""
Funny we just did the same trip in Jan 2014 & it was fabulous. Francis & Andy are my sister & brother-in-law. We live right here in Shedd, Or & I work in Corvallis at the clinic.